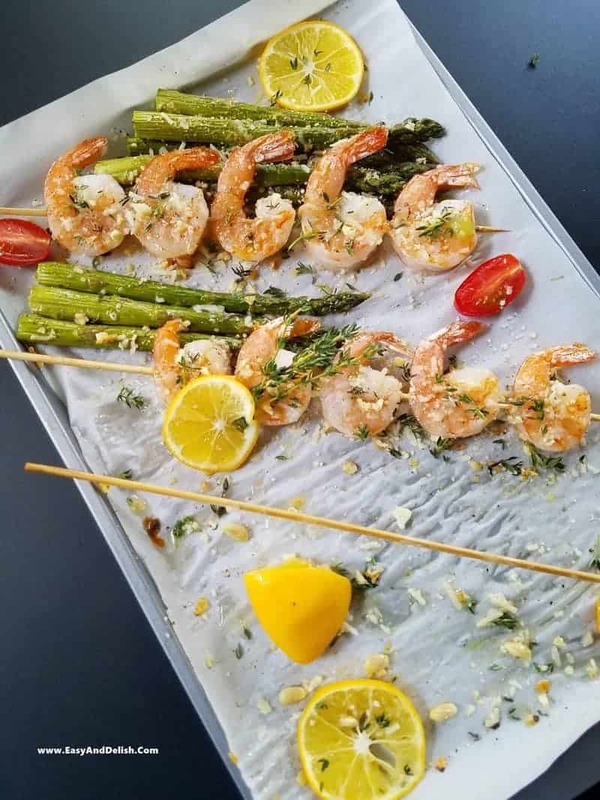 One Sheet Pan Lemon Garlic Parmesan Shrimp and Asparagus that can be prepared in less than 30 minutes. It is a no hassle, mess-free, elegant meal! This is an elegant dish with no hassle! It is mess-free as well. So hello– cleverness is written all over this one, folks! …on a parchment paper-lined large sheet pan. Brush them with olive oil, and then sprinkle on some salt and pepper. Then, throw minced garlic, fresh thyme leaves and grated Parmesan cheese on top… and bake at 400 F for about 8 minutes. Yep! OK! Now remove pan from the oven and make room for the shrimp skewers. Brush them with olive oil and repeat the rest of the process. The only difference is, this time everything should bake for only 5 minutes or until shrimp turns pink. 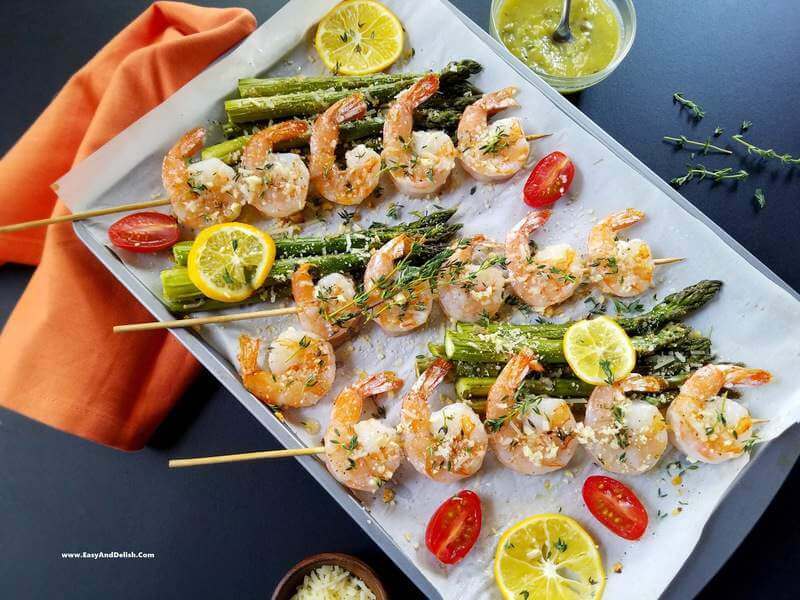 Serve the shrimp and asparagus with lemon wedges, and bon appetit! And yes!!! It involves just a 13-minute cooking process and a less than 30-minutes prep time. Sweet, right? This dish can be served as is… or can be accompanied by any sauce of your choice, a fresh salad, or noodles, if you would like to go for a more substantial meal. This shrimp is also awesome for making shrimp tacos. 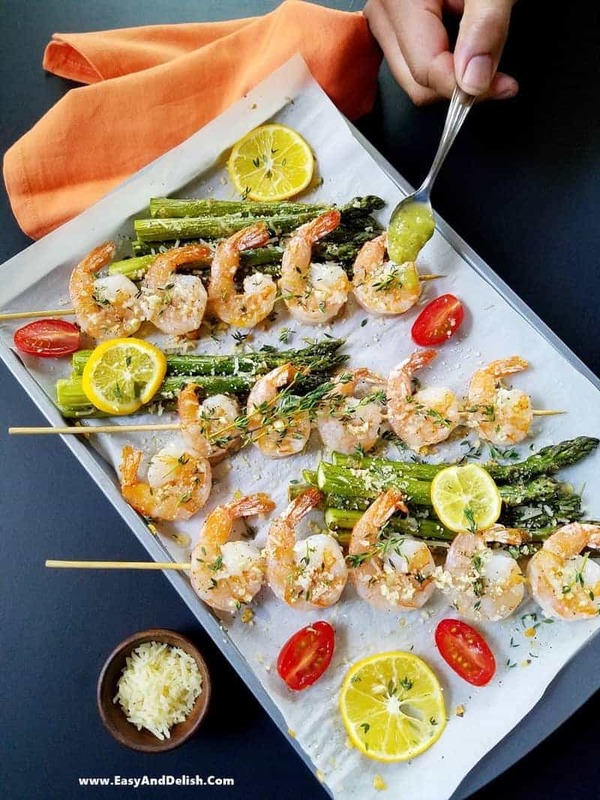 As you can see, this meal can easily transform from one thing into something different by preparing the shrimp and asparagus and simply serving them with different accompaniments. Now tell me– could dinner get any easier than this? I know, I know… everyone is all smiles — both the (lazy) cook and the lucky eaters. 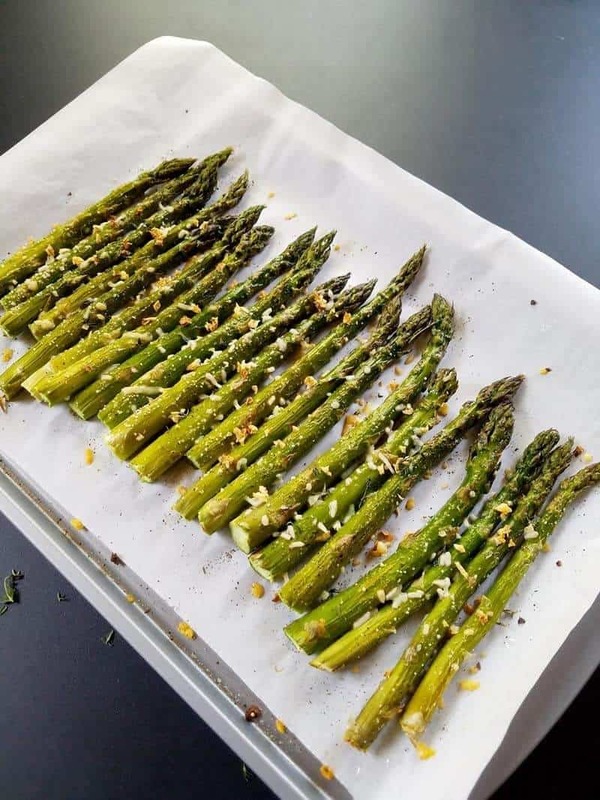 Place trimmed asparagus onto a parchment paper-lined large sheet pan. Brush with olive oil and sprinkle with salt and pepper. 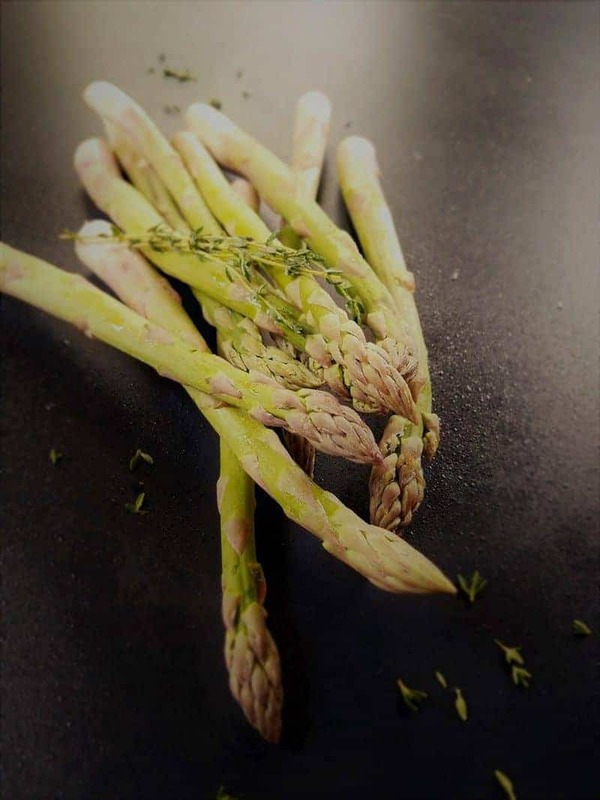 Distribute half the amount of minced garlic on top of the asparagus and then sprinkle 1/2 Tablespoon of thyme leaves as well as about 3-4 Tablespoons of the cheese on them. Bake for 5 minutes or until shrimp turns pink. 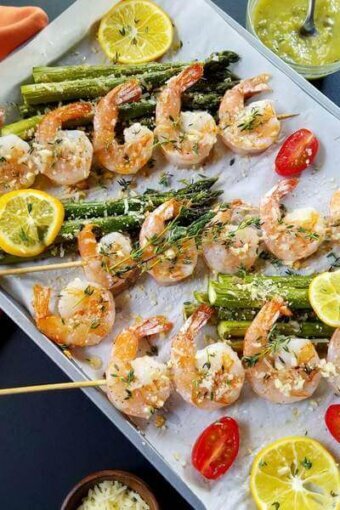 Squeeze lemon juice on top of the shrimp and asparagus and serve immediately by itself or accompanied by your favorite sauce, a fresh salad, or even noodles. Enjoy! I adore shrimp and keep a bag in my freezer for quick dinners! This recipe is a keeper, we are all so busy, yet in need of a tasty and nourishing meal. Enjoy, Deb!!! This is already a family fave at my household. My hubby loved although he is not a fan of seafood. Yum, sounds like my kind of dinner! Thank you, Chris! It is great to have you again here. Sheet pan dinners are fun, aren’t they? And this one looks so tasty and colorful! Really good stuff — thanks. Thank you and enjoy! My daughter and I love this dish. Looks delicious! One question.. what’s that in the last picture that you are spooning on the shrimp? Some kind of pesto perhaps? I was spooning a store-bought chili verde avocado sauce. But you can use pesto, chimichurri, chili verde sauce, or any other of your choice. Bon appetit! Sounds good! I love both asparagus and shrimp. A little bit sour from lemon will make the flavor more delicious.